Yes, it’s that time of year again. The Native American Day of Mourning. Thanksgiving. 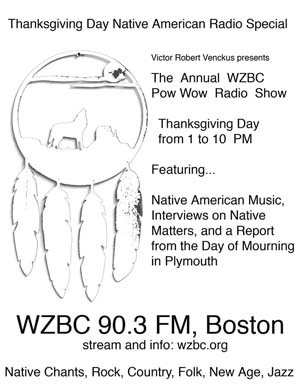 Victor R. Venckus hosts what must be his 25th (or 200th) Annual WZBC Pow-Wow. Native American or Native American-inspired music from all possible genres, all day on Thanksgiving, this year being Thursday, November 27, from 1-10pm on WZBC 90.3 FM. You can tune in via the interweb at www.wzbc.org. It’s an awesome show, so as you’re OD’ing on Tryptophan or slicing into your Tofurkey, check him out. Gray, drizzly morning, fog thick on the harbor, shrouding secret cruise ships, tankers, military vessels – or perhaps something even more sinister. No one knows, in the mysterious, sensuous gloom. But you feel they’re out there, stealthily lurking to and fro with their unknown cargo. Later on in the morning, foghorns cry their mournful song, harmonizing with the seagulls. These are perfect sorts of days for me, standing on my porch with a cup of tea. Thoughtful, wistful, vaguely sad, though I find it does not depress. On the contrary, I welcome it like a comforting shawl that wraps itself securely around me. The pursuit of happiness feels to me like a game in a carnival. So difficult. So random. So elusive. All those endless floating ducks circling past you, and you know that one – only one – has your dreams, your desires, your hopes, casually revealed on its bottom. So you put your money down, and pluck one up. Nope, not that one. And more money, and again. No. And still more money, more effort, as time slips by, the hours, the days, the years. You try to concentrate, you try not to concentrate. To focus, to not focus. To clear the mind, to meditate, to approach the matter in a Zen-like, irreverent fashion. They’re not ducks, they’re grains of sand, or toy soldiers, or jellybeans. And this isn’t important, this isn’t your happiness at stake, not the purpose of your life, but a child’s fancy. Let it go, release the expectations, release the fears, release the sense of struggle, the sense of anything. But in trying not to try, you’re caught up in that eternal riddle. After promising earlier this year that I would make a concerted effort to support local bands, finally last night I decided that I was in the mood for some live music. I headed out to a show at The Middle East Upstairs, featuring four Boston-area bands: Left Hand Does, Thick As Thieves, This Car Up & The Shills. I had given them all a quick listen first on MySpace and they sounded very cool and indie rock & pop-ish, with some pretty melodic stuff mixed in – just what I wanted.